What is Israel’s problem with ships? Why do they seem to cause us so much trouble? 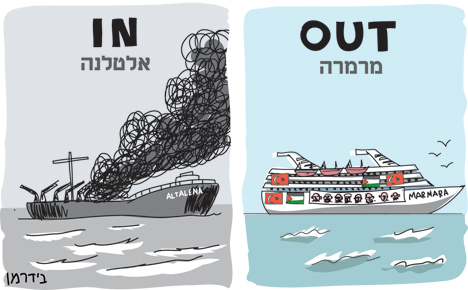 I’m thinking of course of the latest flotilla to Gaza, but also of the Altalena, which returned to the headlines last week, as well as last year’s Marmara and other ships over the course of Israel’s short history. Clearly, there are all sorts of differences between the Gaza flotilla and the Altalena (the Irgun ship bringing in troops and weapons, shelled and sunk at Ben-Gurion’s command in June 1948). Yet despite the differences, there are also similarities. Both constitute/d direct challenges to authority. Both are symbolic of far more than the ships themselves. Another similarity may be that Israel would do well to stay out of it, not to get involved. To raise the Altalena, particularly at a time when there is so much tension within Israeli society between different sectors, and when Israel’s democratic system is perceived to be under attack, is to dig up all the bitterness and anger from this distressing episode in Israel’s history. This act at this particular time (and perhaps there is no good time for such an act) can only cause further damage to the fabric of Israeli society. As far as the flotilla to Gaza goes, the purpose is clearly symbolic provocation. According to the declarations of the participants, the Gaza flotilla is designed to bring food supplies and medications to the besieged population of Gaza. Whether or not there is a small number of participants planning to resist the Israeli forces using violence if necessary, our insistence on blocking the flotilla clearly has nothing to do with preventing missiles reaching Gaza. Even the army is not suggesting that the ships are carrying significant quantities of arms. That claim would be ludicrous anyway – why would terrorists attempt to smuggle arms on ships they know will be stopped, when the tunnels from Egypt into the Gaza strip allow the transportation of hundreds of brand new cars, cement and other building supplies, let alone weaponry. Israel’s government has apparently spent the last two days discussing the flotilla. I wonder whether they considered non-military intervention? Did the cabinet ask itself what the purpose of the flotilla is – to focus world attention on Gaza– and how best we can foil that purpose? Is another navy confrontation the best way to avoid world attention? Did the government go back a stage and ask itself whether the continued embargo on goods reaching Gaza is achieving its goal, whatever that might be, now that the tunnels are unobstructed and Egypt intermittently opens its border? Last year, after insisting that the blockade on Gaza was essential, the government lifted much of the blockade in response to the Marmara disaster. So I guess it wasn’t all that essential after all. I wish I had confidence that this time the government is asking itself the right questions. Unfortunately,Israel does not handle symbolic protest well. And perhaps it’s too much to expect – the whole beauty of non-violent symbolic action is that it very difficult to counter. It is difficult to say how Israel should respond to unarmed protestors walking towards her borders. What is clear, however, is that meeting symbolic protest with nothing more sophisticated than brute force is doomed to failure – just as last year’s flotilla proved fatal, both to some of those involved and to Israel’s reputation. Because the flotilla is nothing more than symbolic, Israel would perhaps do well to respond with a symbolic gesture of her own: perhaps sending her own ships with medical and food supplies to join the flotilla, and welcome them with open arms rather than with guns and tear gas. Then the symbolism would be reversed – the Palestinians would be faced with the decision of whether to accept the Israeli ships or not. The phrase which was first introduced as part of a road-safety campaign, but which has become part of common Israeli parlance – ‘Don’t be right, be wise’ – seems to be applicable in this context too. Israel may have the right to defend her sovereignty (though that right as applied to Gaza is debatable). Israel certainly has the ability to enforce the blockade. The question remains – is it wise to do so? « What are the limits to civil disobedience?